Jewish penicillin. Golden broth. Ambrosia. Whatever you call it, a bowl of glistening chicken soup with matzo balls is Jewish comfort food par excellence. But not all soups are created equal. New York City’s most crave-able iterations pay equal attention to the broth (eschewing shortcuts like bouillon powder in favor of long-simmered brews of chicken bones and aromatic vegetables) and the ball. With regards to the latter, a copious amount of schmaltz in the egg-and-matzo-meal batter — or a bit of lift from a hit of baking soda or bubbly water — transforms the simple dumplings (called “knaidlach” in Yiddish) into savory clouds. 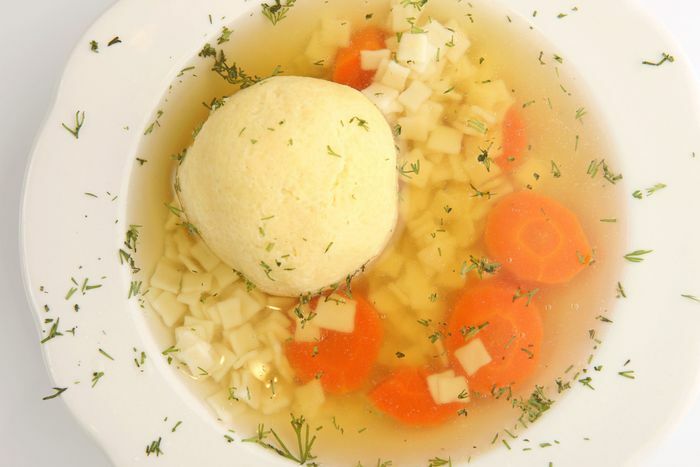 Here are the absolute best places to sit and slurp a bowl of matzo ball soup in New York. Matzo ball soup (a dish more commonly associated with pastrami than lox or herring) is not an obvious choice for a temple of smoked fish. But thank goodness Russ & Daughters includes it on their Lower East Side restaurant’s menu. The chicken leg-based broth is at once delicate and robust, augmented with tender slivers of celery, carrot, and an abundance of shredded chicken pieces. The softball-sized matzo balls get their buoyant brightness from the seltzer and whipped eggs folded into the batter. A scattering of chopped parsley over the gleaming broth is pretty but superfluous — this soup is already as fresh as it gets. The team at New York’s Montreal–inspired deli roasts chicken backs and necks before simmering them together in the soup pot. The resulting broth is complex and full-bodied, with a sultry layer of chicken fat that rises to the top, giving the soup a certain rustic decadence. The vegetables swimming in the bowl, meanwhile, are poached separately so they retain a welcome hint of bite. The soup is plenty satisfying all on its own, but the zaftig matzo ball really gilds the lily. 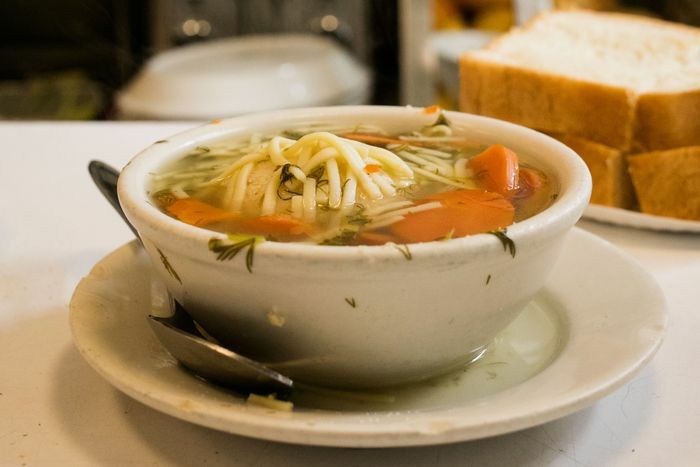 When it comes to soupy drama, nothing tops the 2nd Avenue Deli. Diners are presented with a bowl of carrot medallions, noodles (or kasha or rice), and a schmaltz-enriched matzo ball. The wait staff then pours a stream of shining consommé from a silvery gravy boat over the top with a flourish. Fortunately the soup itself — delicate and fragrant — lives up to the tableside theatrics. For those hoping to make their soup into a meal (or soothe a head cold), they also offer “chicken in the pot” — a half-gallon tureen of broth served with half a boiled chicken along with noodles and matzo balls. The matzo ball soup at this Greenpoint deli has all the classic flavor of the Passover seder table without the holiday dietary restrictions. (To that end, the chopped liver on rye makes a lovely soup companion.) The broth is deeply savory with a thin layer of schmaltz slicking the surface. It comes threaded with tender shreds of chicken and vegetables. And the matzo balls are rich and eggy without sacrificing their supple texture. The one drawback is the soup-to-matzo ball ratio: while tasty, the dumpling crowds nearly two-thirds of the serving container. The addition of chicken feet and an unconventional blend of spices (star anise, coriander, and mustard seed, among others) gives Peck’s chicken broth a particularly rich, robust flavor. 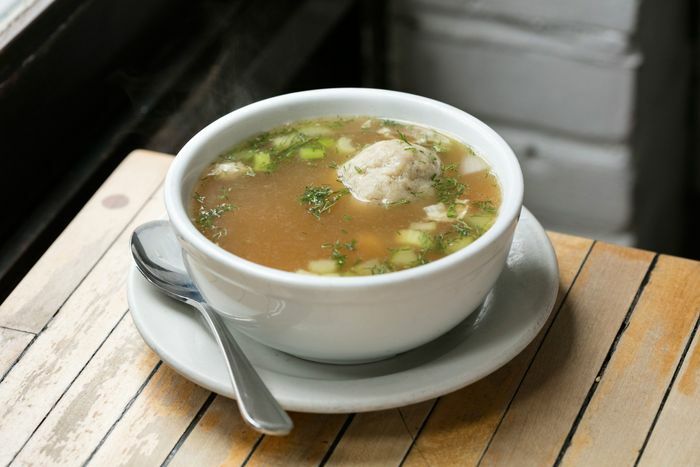 Into the soup they drop silky shreds of their rotisserie chicken and two petite matzo balls — schmaltz-laden dumplings rolled following owner Theodore Peck’s mother’s recipe. The soup is primarily packaged for takeout, but upon request the staff will warm up a bowl for on-site slurping at their sunny communal table. The soup at Soho’s high-end Jewish hotspot has a distinctly botanical vibe, with whole sprigs of parsley and dill adding verdant bite to the bowl. Underneath the greenery, a jumble of slivered carrots, celery, and plush bites of chicken swim in a gracefully gilded broth. The ample matzo ball is flavorful but on the hearty end of the spectrum — not off-putting, but firmer than most. At $14 a bowl, Sadelle’s take on Jewish penicillin is among the city’s priciest. But for those who prefer to take their comfort food awash in elegance, it is worth the splurge. The Upper West Side’s iconic “Sturgeon King” also turns out a satisfying bowl of soup. The consommé is bright with a hint of caramel sweetness, and though unmarred by bits of vegetables or meat, it brims with ultrathin egg noodles. The matzo ball is textbook-perfect — at once light and substantial — and the size of a generous scoop of ice cream. An extra ball can be added upon request, but stick to one to save room for a platter of smoked fish. Shalom Japan’s menu includes many dishes that merge chef-owners Aaron Israel and Sawako Okochi’s respective Jewish and Japanese backgrounds. One of the best is their matzo-ball ramen. The broth skews mostly traditional (chicken, onion, carrot, celery, parsnip), but with oceanic undertones from a hit of kombu. 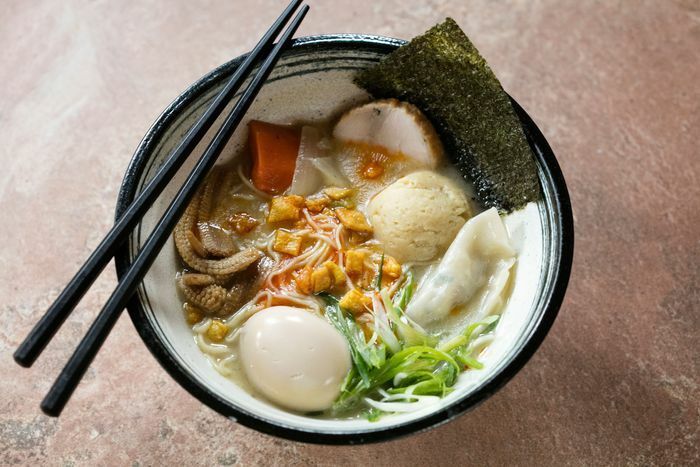 In addition to a very fine matzo ball, the bowl is layered with ramen noodles and a piece of char siu chicken, and garnished with scallions, baby corn, a crackly sheet of nori, crispy fried soup mandel (think miniature croutons), and a drizzle of togarashi garlic oil. Optional (but recommended) add-ons include a gyoza-style foie-gras-and-garlic-chive dumpling and a soy-and-mirin-marinated soft-boiled egg. This downtown Jewish bistro takes matzo ball texture seriously. Their duck fat-infused dumplings are ethereally fluffy, practically collapsing upon themselves at the touch of the spoon. 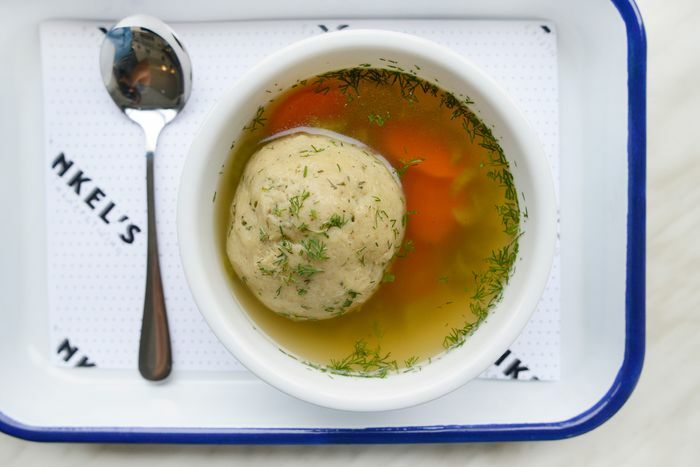 The matzo balls bob in a roasted-chicken broth alongside ribbon-thin slices of carrot and a copious shower of fresh dill. Pro tip: Request a small container of their housemade, zhug-like hot sauce with your bowl of soup. A little drizzle provides a delightful dose of cross-cultural heat and flavor. On any given day, this pint-size East Village temple of Jewish comfort food has half a dozen soup pots bubbling at the ready. Among the tastiest options is their vegetarian matzo ball soup — a meat-free but umami-rich broth brimming with sliced carrots and noodles, festooned with fresh herbs, and served alongside thick-cut, buttered slices of house-baked challah. A soft and sizable matzo ball completes the package. And for those who cannot decide between soup options, the counter staff will (no questions asked) drop a matzo ball into a bowl of their steaming beet-and-cabbage borscht — a colorful and surprisingly gratifying mashup. Abundant photos and two televisions featuring videos of Menachem Mendel Schneerson (the late rabbi of the Lubavitcher Hasidic dynasty) adorn the walls of this kosher steakhouse and grill. For those who prefer such specific décor, or are willing to look beyond it, a delightful bowl of soup awaits. The matzo ball is craggy and tender with a peppery bite. And the broth, which is prepared fresh every morning and comes flecked with carrot and slippery noodles and amply laden with shredded dark meat chicken, is as homey and welcoming as an invite to Shabbat dinner. 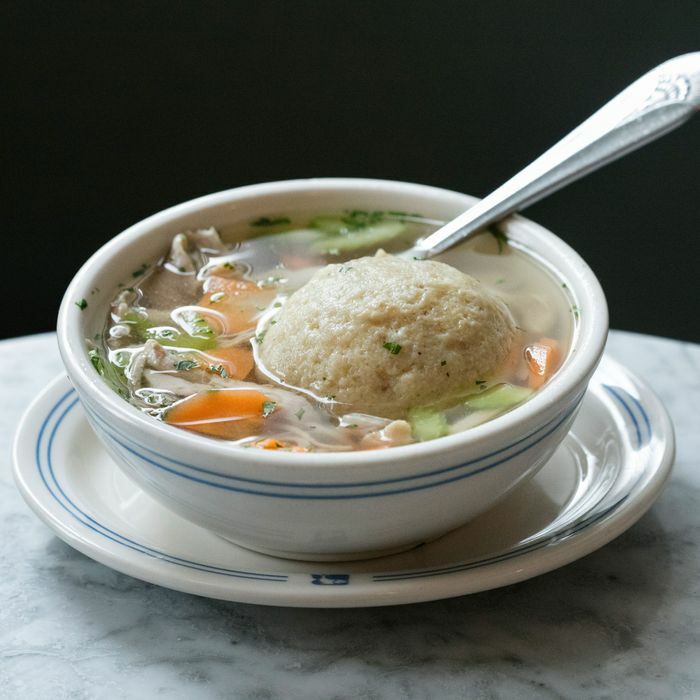 The cozy second-floor restaurant at Fairway’s Upper West Side flagship store ladles out one of the city’s best under-the-radar matzo ball soups. The oversize bowl of crystalline broth is topful with tender white-meat hunks, carrots, celery, and dill. The chubby, irregularly shaped matzo balls look and taste just like ones your bubbie would have rolled. After a morning spent edging out other grocery carts en route to Fairway’s cheese counter, the tranquility of a sunlit table and a bowl of great soup upstairs beckons. As one of the Bronx’s only remaining Jewish delis, Liebman’s carries the formidable responsibility of living up to generations of pastramis past. Thankfully, they are up to the challenge. Their approach to soup is delightfully no-frills — an uncomplicated but satisfying bowl of golden consommé, thin noodles, a whisper of carrots, and a butter-soft matzo ball. Grab a seat in one of the vintage padded booths and happily sip like it’s 1955.